Ankara and Washington hope to reach a political settlement in Cyprus, ethnically split between Greek and Turkish Cypriots, later this year. The Mediterranean island has been divided since 1974, when Turkish troops invaded and occupied its northern third. 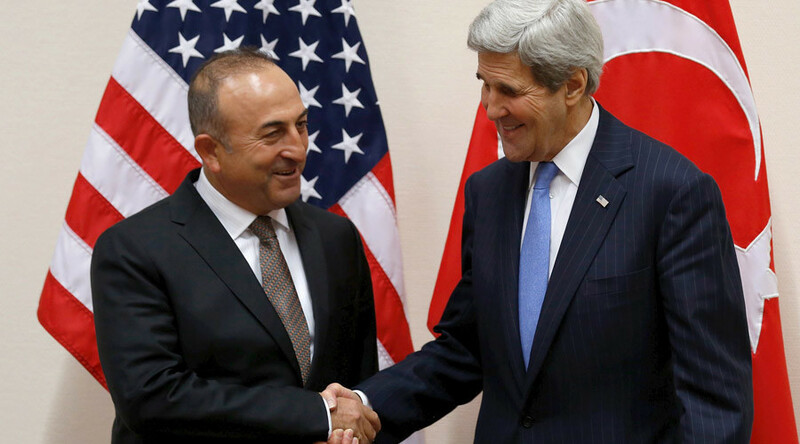 Turkish Foreign Minister Mevlut Cavusoglu met with the US Secretary of State John Kerry in Washington to discuss one of Europe’s longest-running territorial disputes. “We are hoping to reach a settlement in Cyprus in 2016," Cavusoglu said ahead of their meeting on Monday. The Turkish side is “ready,” he added, AFP reported. Since the Turkish occupation, the island has been split into two sectors – the Greek Cypriot side in the south (recognized internationally as Cyprus) and the breakaway Turkish Cypriot state in the north, where Turkey maintains over 30,000 troops. — RT (@RT_com) 16 марта 2016 г. According to Cavusoglu, talks on the long-awaited peace deal had slowed during preparations for May’s legislative elections in the Greek-speaking south of the island. “But after the elections we are hoping to reach a settlement and the United States is giving its full support to this process, as well as Turkey,” he reportedly said. “We have met with the folks on both sides as well as individual countries and we are going keep pushing very, very hard towards a resolution of the Cyprus crisis,” Kerry pledged. Any deal would involve both sides making compromises on territorial and property rights, however. A referendum in 2004 saw a majority of Turkish Cypriots back reunification; over three-quarters of Greek Cypriots voted against it. European Council head Donald Tusk noted earlier this month that the deal with Turkey – the one intended to halt illegal migration flows to Europe in return for financial and political rewards for Ankara – actually hinged on the latter acting to support of peace talks in EU member Cyprus. The migration deal needed to be "an opportunity [for Turkey] to support the settlement talks in Cyprus. Only if this is possible can we move forward here," Tusk said in a letter to EU leaders, according to Reuters. Last week Tusk said a compromise, accepted by Turkish Prime Minister Ahmet Davutoglu to avoid a Cypriot veto on the migrant deal, was a "very promising signal for the future." Cypriot President Nicos Anastasiades had previously threatened to veto any progress in Turkey's EU accession talks unless Ankara meets its obligation to open Turkish ports and airports to Cypriot traffic, effectively recognizing his state. Cyprus had blocked five negotiating topics (known as chapters) for years over Turkey's failure to recognize its right to access Turkish ports as part of a customs union deal with the EU and vowed to veto any deal it disliked. Ultimately, in return for taking back migrants from Greek islands, Turkey settled for - among other benefits - opening just one chapter, which Cyprus had not frozen. Cyprus’ decision to open up a third licensing round for exploration rights in the bitterly-contested Exclusive Economic Zone (EEZ) could put the peace deal, whose goal is a unified, federal Cyprus at risk, however. Anastasiades, speaking after a meeting with Turkish Cypriot leader Mustafa Akinci, recently warned against Turkey attempting to prevent potential drilling in EEZ, the Cyprus Weekly reported, adding that the president suspended peace talks in 2014 after Turkey dispatched a research vessel to carry out seismic surveys inside the RoC’s EEZ.